I decided to write my column while sitting in the waiting room in the doctor’s office. We are two hours from home. I am always glad when we are on our way home from these visits. My thoughts go back to one of our recent trips to see the doctor. On the way there, our driver didn’t see a ramp that must have fallen off another vehicle. Earlier we had seen a truck with a skid loader on top of its trailer, so perhaps it was a ramp that fell off that truck. Anyway, a ramp was laying in the center of the lane in which we were traveling. Our driver swerved to miss it, but it slashed open the back tire of the fourteen-passenger van. It threw us around for a while, but how thankful we were that she gained control of the van. I think back at what could have happened and how bad it could have been, with the oncoming traffic. God was watching over us! The van didn’t have a spare tire, and we were eight miles from the nearest town. A man from the house that we were parked beside came out to see if he could help us. He drove our driver to town to get a new tire and then he helped to put it on the van. Two hours later, we were back on our way. We actually made it in time for the doctor appointments. We make these appointments quite a few months early, and we always give ourselves enough time in case we have trouble on our way. How nice to know there are still a lot of people in this world who will take time to help someone in need. We really appreciated the time the man took to help get us on our way. He wouldn’t take any money for his help. So if by any chance you read this column—thanks again, Mark from Coldwater, Michigan! May God bless you for your kindness that day. On Saturday my husband, Joe, sons Benjamin, 18, and Joseph, 15, and I took time to till, weed and hoe both gardens. It really is easier when we all help each other! 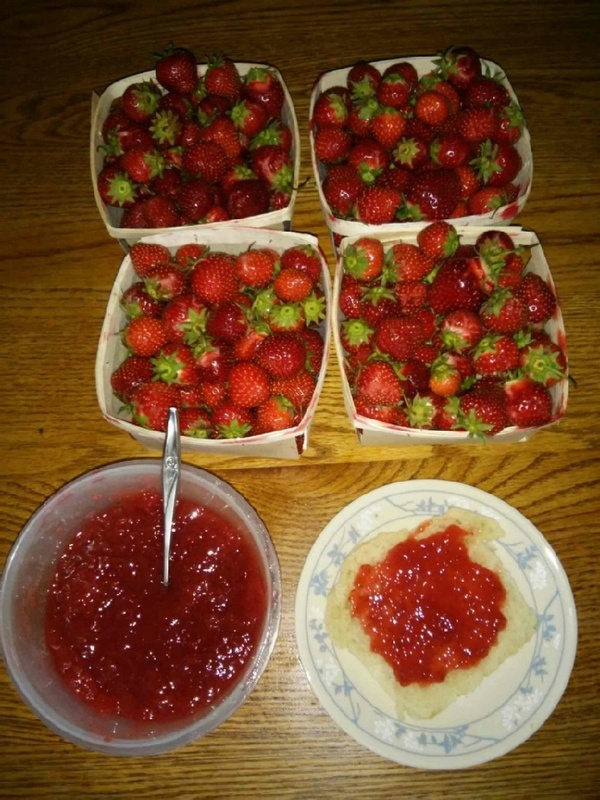 Last week Lovina made eight pints of strawberry jam, which is tasty on top of the homemade bread that daughter Lovina, age 14, made this week. 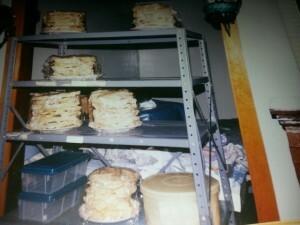 Daughter Lovina, 14, mixed the dough for ten loaves of bread. She still needs to ask a few questions when mixing it. She caught on quickly that you must add more flour if the dough is still sticky. I put the dough in loaf pans and put it in the oven. I am hoping she can do that part soon as well. It would save me time if she could mix and bake bread, and it’s good for her to know how to do it. Five of the loaves were to take to church at our neighbors’ place on Sunday. I sent some home with daughter Susan and Mose, and we enjoyed the fresh bread over the weekend with fresh strawberry jam. The week before I made eight pints of strawberry jam. It is a favorite around here. I still want to make lots more for the freezer. On Friday we will attend the wedding of Rhonda and Marlin. Rhonda is a girl from our church. It has been a rainy week, so I wish them a nice day on Friday. It’s nicer for the guests as well when the day is nice. I will help Susan by taking care of Jennifer while Susan cooks. One day last week I was making some phone calls. We have a phone in an outside building. Before I was done, the phone rang, and it was the number brother Albert and his family usually call from. I answered, and it turns out that Albert had accidentally called us instead of the repair shop he wanted. Our number was on the same page, and somehow he dialed our number. He was really surprised and didn’t recognize my voice. I thought he was teasing when he asked if this is the repair shop, so I said yes! Anyway, it was so good to talk to him again. With brother Amos’s sudden death in January, it’s even more precious to talk to siblings. I imagine sister-in-law Sarah Irene wondered where Albert was that long, but we had a nice talk together. It seems we don’t see much of Albert and his family. We all get busy with our own families, and it’s so easy to put off getting together. Nephew Levi’s wedding is in two weeks, so we hope to see the family there. Mix together flour, sugar, baking powder, salt and baking soda. In a separate bowl, mix eggs, applesauce and melted butter. Add dry ingredients and stir until well blended. Fold in berries. Pour into one or two greased loaf pans. Bake at 350 degrees for 50–60 minutes. 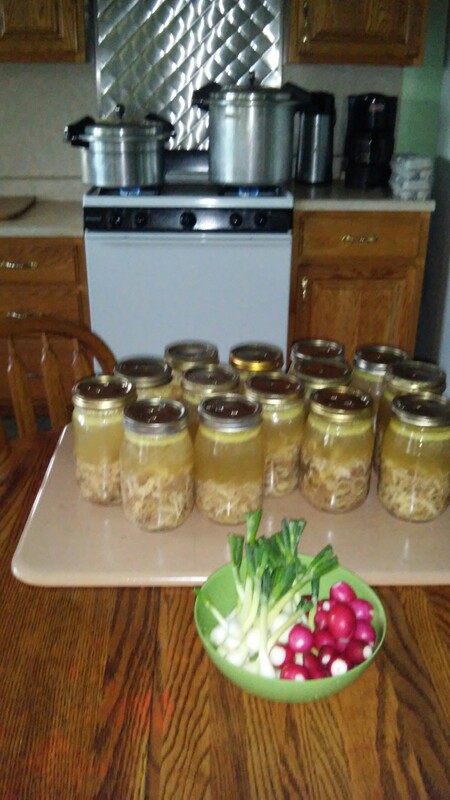 We recently butchered our old laying hens and canned around fifty quarts of chicken broth. My husband, Joe, and our children are home on vacation the week of July 4. So this week I’m sharing some extra recipes. The Eicher family canned chicken broth this week—a staple for use at Amish weddings. A reader recently requested a recipe for red velvet cake made with beets. Here is the recipe. Preheat oven to 350 degrees. Line a 9 x 13-inch baking pan with parchment paper. Sift flour and baking powder together. In another large bowl, whisk together sugar, buttermilk, beets, oil, eggs, cocoa powder, food coloring, vanilla, vinegar, baking soda and salt. Add flour mixture gradually to the bowl, stirring after each addition. Pour batter into prepared pan. Bake about 35 minutes or until toothpick inserted in center comes out clean. A reader also requested the recipe for Cherry Delight. In a bowl, mix graham cracker crumbs, melted butter and 1 tablespoon sugar. Spread on bottom of a 9 x 9-inch baking pan to form a crust. Beat together whipped topping and cream cheese, adding remaining sugar and vanilla until well blended. Smooth on top of crust. Top with cherry pie filling. Chill at least 3 hours. Preheat oven to 450 degrees. With an electric mixer, cream together the butter, sugar and oil until smooth. Add the egg, yogurt and almond extract to the sugar mixture and mix well. In a separate bowl, combine the first four dry ingredients. Slowly add the dry mixture into the wet mixture. Add the chopped rhubarb and strawberries and lightly mix in. Place paper liners in muffin tins. Use a 1/4 cup scoop to fill the liners. Sprinkle a little brown sugar on the top of each muffin. Bake for 12–14 minutes or until golden on top. Makes 18 muffins. In a skillet, cook bacon until crisp. Remove with a slotted spoon; crumble and set aside. In the drippings, sauté onion and green pepper until tender; remove with a slotted spoon. Beat eggs and milk in a large bowl. Stir in hash browns, cheese, salt, pepper, dill weed, onion, green pepper and bacon. Transfer to a greased 9 x 13-inch baking pan. Bake uncovered at 350 degrees for 35–45 minutes or until a knife inserted near the center comes out clean. Yields 6–8 servings. Also, I need to make several corrections to the Blueberry Cobbler recipe that appeared in my column in newspapers and online the week of June 19-23. Several readers alerted me to some problems, and I have made some revisions. Thanks for your feedback! Combine ingredients in a bowl, mix together and spread batter in a 7 x 11-inch pan or 2-quart baking dish. Mix together blueberries and sugar; pour over batter and bake at 350 degrees for 45–60 minutes or until done. Try with different types of fruit. Lovina Eicher is an Old Order Amish writer, cook, wife and mother of eight. She is the co-author of three cookbooks; her new cookbook, The Essential Amish Kitchen, is available from 800-245-7894. Readers can write to Eicher at PO Box 1689, South Holland, IL 60473 (please include a self-addressed stamped envelope for a reply) or at LovinasAmishKitchen@MennoMedia.org. June 14, 2017: Twenty-three years ago today my husband, Joe, and I became parents for the first time. We were blessed with a little girl. We named her after my mother, Elizabeth. Since her marriage on August 14, 2015, she goes by the name Mrs. Timothy (Elizabeth) Bontrager. A little girl, Abigail, was born to Elizabeth and Timothy on September 10, 2016. Time goes on—one generation after another. We are having a heat wave with temperatures in the nineties, and it’s very humid! The girls and I drove the seven miles to Timothy and Elizabeth’s house this morning by buggy. We spent the day with her and Abigail. We didn’t do much besides relax, which was so nice! My sister Verena gave Abigail a little kiddie pool for a baby gift. Daughter Lovina and son Kevin filled the pool, and Abigail had so much fun under the shade tree, splashing the water. The rest of us sat around the pool. All it took was one person throwing a little water at another and, well, it turned into a big water battle! At least it cooled us off on this hot, muggy day. Tomorrow we will attend the wedding of our neighbor boy, Melvin, to Rebecca. It is hot weather to prepare for a wedding. Now tonight we are having thunderstorms and rain. It was so dry, and we needed the rain. Son-in-law Mose tilled the garden tonight before the rain. I made quite a few gallons of iced spearmint tea, which is a good thirst quencher on these hot days. Lovina made lots of fresh thirst-quenching mint tea this week. 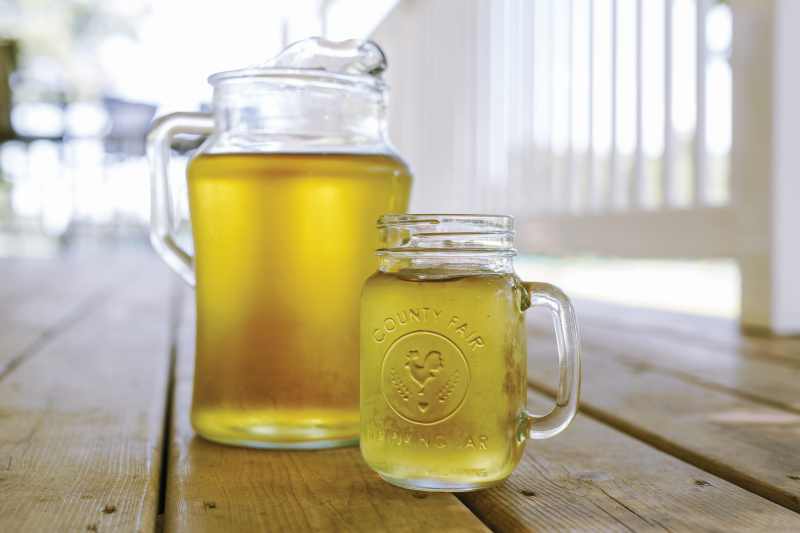 Photo by Lucas Swartzentruber-Landis, from The Essential Amish Cookbook. We have our haymow almost filled with hay for next winter. We appreciated all the help we had from family and neighbors to put in over thirteen hundred bales of hay in our barn last Thursday. Lots of hot, hard work! Having hay stored for future use is a good feeling. But it’s hard on the pocketbook, with hay still a little pricey. Construction is finally underway at my sisters Verena and Susan’s house, who had a house fire last month. The new roof was put on today. They are still living in our basement. I want to wish Uncle Jake and Aunt Mary Coblentz a happy 60th anniversary! Wow! That is a long time to be together. I wish them more healthy and happy years together. Jake was my dad’s brother. Jake and Mary have three children: Christina, Tabitha and Cornelius. I hardly ever see them anymore. It would be nice to attend the Coblentz reunion again in July. Tonight daughter Susan and Mose had us over for supper. They also told my sisters to come eat there too. On the menu were sausage patties, French toast and scrambled eggs. How nice to have a break from cooking. Everything was delicious! The French toast tastes real good with fresh maple syrup poured over it. It was the syrup Mose cooked off from our maple trees this spring. The girls are cleaning out their closets in their spare time. We are getting a head start on cleaning. Timothy and Elizabeth visited one evening with their new Amish neighbors, John and Norma. They moved nearby from a community in Indiana. They will attend our church district. They have two daughters ages three and thirteen months. I am looking forward to meeting them on Sunday. It is 11:00 p.m. now and past my bedtime. The rest have all gone to bed. I knew I might not have time to write tomorrow morning so decided to get this written tonight yet. I wish everyone God’s greatest blessings! Good night to all! Try this recipe while blueberries are in season. Combine ingredients in a bowl, mix together and spread batter in pan. Pour over batter and bake at 325 degrees for 45–60 minutes or until done. Try with different types of fruit.